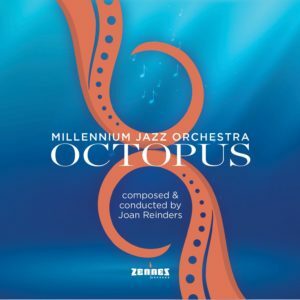 Octopus, the tenth album released by the Millennium Jazz Orchestra in its nearly twenty- five years of impressive music-making in The Netherlands, is actually an eight-part suite by composer / arranger Joan Reinders devoted to one of the sea world’s more fearsome and enigmatic creatures. The thematic essay spans the whole nine yards, from “Evolution” and “Environment” to “Food,” “Procreation” and several diverting stops in between. It was recorded in concert in May 2018 at Theater Bouwkunde Deventer. Part 1, “Evolution,” begins appropriately enough with a long moment of silence, symbolizing the vast millennia leading to meaningful growth, before modulating into a fugue for three flutes and a showcase for the pensive improvisations of pianist Dirk Balthaus. “Stature,” which follows, offers a more open-handed look at the octopus’ unusual physique and its defense mechanisms that include poison glands in its beak, a heavy framework that is stoutly reinforced by tenor saxophonist Volker Winck. When the octopus is “Moving Forward,” as it does in Part 3, it advances with grace and power, stratagems that are astutely brought to life by the Millennium’s forceful brass, supple reeds and the outspoken alto of Gerlo Hesselink. Flugelhorist Suzan Veneman takes stock of the octopus’ shadowy “Environment,” aided once more by the orchestra’s snug and powerful section work, while “Food” looks into such dietary staples as crabs, lobsters, fish and even other cephalopods, with Balthaus, baritone Coen Kaldeway and soprano Rob Sijben epitomizing the various delicacies on the menu. The lyrical “Procreation” delves into the octopus’ love life, which, as Reinders observes in the liner notes, “doesn’t really amount to much.” Nevertheless, trombonist Gregor Sperzel and bassist Bart Tarenskeen do their best to emulate a romantic liaison, which leads in many cases to the female of the of the species dying of exhaustion after laying her eggs and watching them hatch. Even as menacing as it may seem to others, the octopus has a large number of “Enemies,” whose incursions are laid bare in an up-tempo milieu that is underlined by Veneman, Hesselink, Vinck and the orchestra’s stalwart rhythm section anchored by drummer Felix Schlarmann. And as the octopus relies on “Camouflage” to confuse and deflect those enemies, so Reinders leans on variations in mood and color to grant the eight-armed sachem a secure musical shelter. There to lend a solo hand are Schlarmann and flugel Florian Sperzel, setting the stage for a demure closing statement from Martin van den Berg’s bass tuba. Much as has been summarized here, the narrative barely scratches the surface of Reinders’ luminous and colorful suite, which must be heard from end to end to be fully appreciated. Once “Evolution” and “Stature” have been canvassed, the MJO digs in hard to transition from cerebration to swing and the suite really takes wing, enwrapping its uncommon theme in a palisade of straight-on contemporary big-band jazz. One final note: even though the sixty-four-minute long “Octopus” was recorded live, there is applause only at the end of the last movement. The audience must have been spellbound—and so may you be. Track Listing: Evolution; Stature; Moving Forward; Environment; Food; Procreation; Enemies; Camouflage. Personnel: Joan Reinders: composer, arranger, conductor; Sander Zweerink: trumpet; Suzan Veneman: trumpet; Bas Konings: trumpet; Herman Nijkamp: trumpet; Florian Sperzel: trumpet; Gerlo Hesselink: alto, soprano sax, flute, piccolo; Rob Sijben: alto, soprano sax, flute; Volker Winck: tenor sax, flute; Martin van der Horst: tenor sax, clarinet; Coen Kaldeway: baritone sax, bass clarinet; Gregor Sperzel: trombone; Jochen Niehaves: trombone; Jan Peter van der Hoeve: trombone; Martin van dan Berg: bass trombone, tuba; Dirk Balthaus: piano; Bart Tarenskeen: bass; Felix Schlarmann: drums.